What Is the Renaissance in Architecture? The Renaissance describes an era from roughly 1400 to 1600 AD when art and architectural design returned to the Classical ideas of ancient Greece and Rome. In large part it was a movement spurred on by the advances in printing by Johannes Gutenberg in 1440. 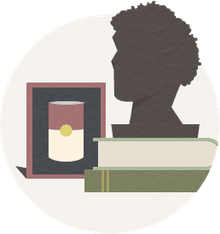 The wider dissemination of Classical works, from the ancient Roman poet Virgil to the Roman architect Vitruvius, created a renewed interest in the Classics and a humanist way of thinking—Renaissance Humanism—that broke with long-standing medieval notions. This "age of "awakening" in Italy and northern Europe became known as the Renaissance, which means born anew in French. The Renaissance in European history left behind the Gothic era—it was a new way for writers, artists, and architects to look at the world after the Middle Ages. In Britain it was the time of William Shakespeare, a writer who seemed to be interested in everything—art, love, history, and tragedy. In Italy, the Renaissance flourished with artists of innumerable talents. Before the dawn of the Renaissance (often pronounced REN-ah-zahns), Europe was dominated by asymmetrical and ornate Gothic architecture. During the Renaissance, however, architects were inspired by the highly symmetrical and carefully proportioned buildings of Classical Greece and Rome. Artists in northern Italy were exploring new ideas for centuries before the period we call the Renaissance. However, the 1400s and 1500s brought an explosion of talent and innovation. Florence, Italy is often considered the center of Early Italian Renaissance. During the early 1400s, the painter and architect Filippo Brunelleschi (1377-1446) designed the great Duomo (cathedral) dome in Florence (c. 1436), so innovative in design and construction that even today it's called Brunelleschi's Dome. The Ospedale degli Innocenti (c. 1445), a children's hospital also in Florence, Italy, was one of Brunelleschi's first designs. Brunelleschi also rediscovered the principles of linear perspective, which the more refined Leon Battista Alberti (1404-1472) examined further and documented. Alberti, as a writer, architect, philosopher, and poet, became known as the true Renaissance Man of many skills and interests. His design of the Palazzo Rucellai (c. 1450) is said to be "truly divorced from the medieval style, and could finally be considered quintessentially Renaissance:" Alberti's books on painting and architecture are considered classics to this day. What is called the "High Renaissance" was dominated by the works of Leonardo da Vinci (1452-1519) and the young upstart Michelangelo Buonarroti (1475-1564). These artists built on the works of those who came before them, extending a classical brilliance that is admired to this day. Leonardo, famous for his paintings of The Last Supper and the Mona Lisa, continued the tradition of what we call the "Renaissance Man." His notebooks of inventions and geometrical sketches, including the Vitruvian Man, remain iconic. As an urban planner, like the ancient Romans before him, da Vinci spent his last years in France, planning a Utopian city for the King. During the 1500s, the great Renaissance master, the radical Michelangelo Buonarroti, painted the ceiling of the Sistine Chapel and designed the dome for St. Peter's Basilica in the Vatican. Michelangelo's most recognizable sculptures are arguably the Pieta and the grand 17-foot marble statue of David. The Renaissance in Europe was a time when art and architecture was inseparable and the skills and talents of a single man could change the course of culture. Often talents worked together under Papal direction—Raphael, another High Renaissance artist, is said to have worked on St. Peter's Basilica, too. A Classical approach to architecture spread through Europe, thanks to books by two important Renaissance architects. Originally printed in 1562, the Canon of the Five Orders of Architecture by Giacomo da Vignola (1507-1573) was a practical textbook for the 16th century builder. It was a "how-to" pictorial description for building with different types of Greek and Roman columns. As an architect Vignola had a hand in St. Peter's Basilica and the Palazzo Farnese in Rome, Villa Farnese, and other large country estates for the Catholic elite of Rome. Like other Renaissance architects of his time, Vignola designed with balusters, which became known as banisters in the 20th and 21st centuries—our stairway safety is really an idea from the Renaissance. 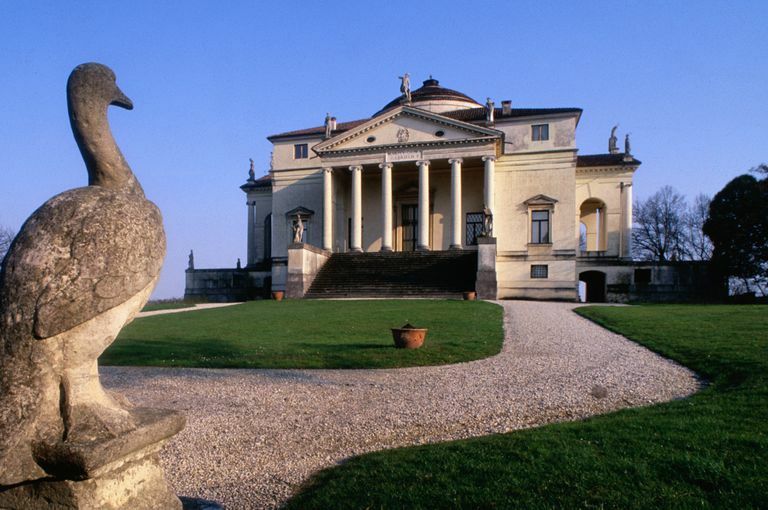 Andrea Palladio (1508-1580) may have been even more influential than Vignola. Originally published in 1570, The Four Books of Architecture by Palladio not only described the five Classical Orders, but also showed with floor plans and elevation drawings how to apply the Classical elements to houses, bridges, and basilicas. In the fourth book, Palladio examines real Roman temples—local architecture like the Pantheon in Rome was deconstructed and illustrated in what continues to be a textbook of Classical design. Andrea Palladio's architecture from the 1500s still stands as some of the finest examples of Renaissance design and construction. Palladio's Redentore and San Giorigo Maggiore in Venice, Italy are not the Gothic sacred places of the past, but with columns, domes, and pediments they are reminiscent of Classical architecture. With the Basilica in Vicenza, Palladio transformed the Gothic remains of one building into what became a template for the Palladian window we know today. La Rotonda (Villa Capra) shown on this page, with its columns and symmetry and dome, became a template in years to come for a "new" Classical or "neo-classical" architecture worldwide. As Renaissance approaches to building spread to France, Spain, Holland, Germany, Russia, and England, each country incorporated its own building traditions and created its own version of Classicism. By the 1600s, architectural design took another turn as ornate Baroque styles emerged and came to dominant Europe. Long after the Renaissance period ended, however, architects were inspired by Renaissance ideas. Thomas Jefferson was influenced by Palladio and modeled his own home at Monticello on Palladio's La Rotonda. At the turn of the twentieth century, American architects like Richard Morris Hunt designed grand style homes that resembled palaces and villas from Renaissance Italy. The Breakers in Newport, Rhode Island may look like a Renaissance "cottage," but as it was built in 1895 it is Renaissance Revival. If the Renaissance of Classical designs had not happened in the 15th and 16th centuries, would we know anything of ancient Greek and Roman architecture? Maybe, but the Renaissance sure makes it easier.